June 1916 Butler Bros. Wholesale Catalog. This is a very good place to bring attention to the fact that some pages are missing from the BUTLER BROS. REPRINT CATALOGS! Some of you will already have discovered that. Many among those who collect carnival glass have had the experience of dealing with printers over the years. To state it mildly, they are a “select” group. Following nearly two years of gleaning carnival glass information from the 42 old Catalogs at hand, (this while handling a 40+ hr. work week), Dean and I visited more than 20 printers in San Diego area before finding one who “thought” he could tackle and provide 500 reprints. Most had thrown their hands in the air, declaring we should return to the original printer!!!! ?? (LOL)!! Modern-day machinery is not calculated to handle the page size required for reproducing this size. An estimated completion date was established with the “one venturesome printer”, but when we had not received word to that effect, we decided to go there to inquire of the progress. Without going into the expletives which were thrown at us on arrival, let me simply say that there were more catalog pages thrown into a multitude of trash bins, and scattered over the floor than were assembled into completed books. While Dean attempted to calm the attitude of the man in charge, I systematically went about the room gathering up the loose sheets from their “tossed positions”. In “so many very loud and direct innuendoes”, the printer said he had had “enough already!” We paid his fee, took some 200 completed examples and all the “loose ends” I had gathered up from the trash and we departed that scene. We had never put this story into print until now. While correlating this segment on Open Edge Baskets, I referred to the pattern index in our Butler Catalog, only to discover that the 1911 Mid-Spring page displaying Open Edge Basket is missing! (smile) (Perhaps none of the catalogs received that page?) Please forgive us! It proves one thing: Wrong-doing extends over a long period of time. 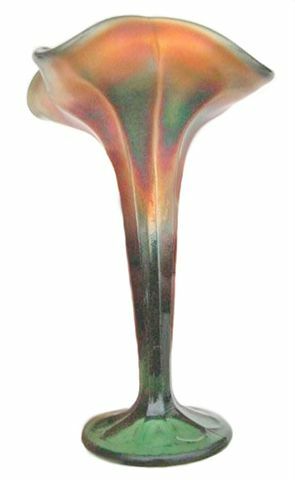 Appears to be the vase seen in this 1916 Fenton Glass ad. 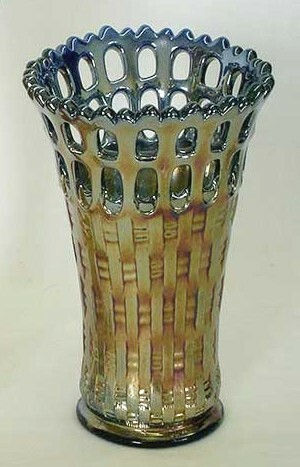 GREEN VASE: The 1916 Butler Bros. 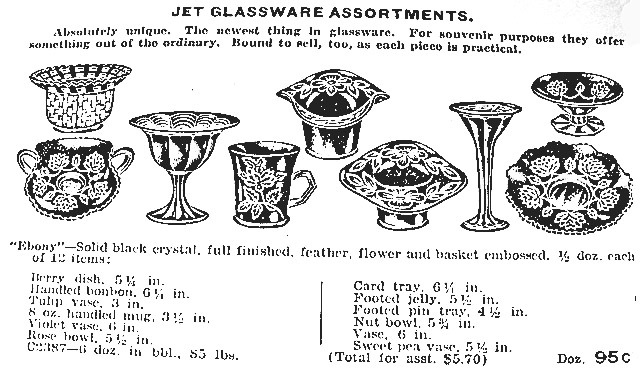 Catalog ad presents Fenton glass produced in “Black Crystal ”, but it clearly displays evidence of the production of this extremely scarce vase, and the shape used for some of the Open Edge Baskets. Shall we name the vase: FENTON PANELS? 3-Row OPEN EDGE - Celeste. 3-Row OPEN EDGE BASKETS in Lime Green. 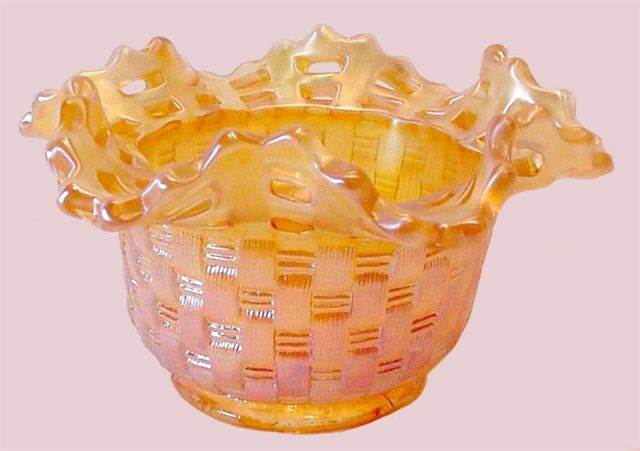 3-ROW OPEN EDGE BASKET: These are slightly larger than their 2 row counterparts and there seem to be fewer of them. Plates of 9 ¼” size are extremely rare. A white example brought $6,000 in 1999. It had been in the collection of the late Bob Gallo for many years. We have not heard of another example in white. 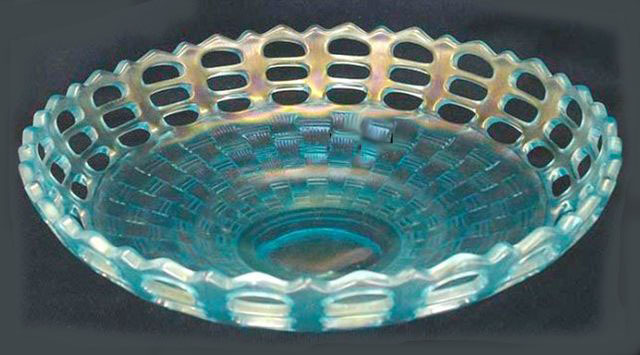 One known plate in ice blue is (was) housed in the Fenton Glass Museum. 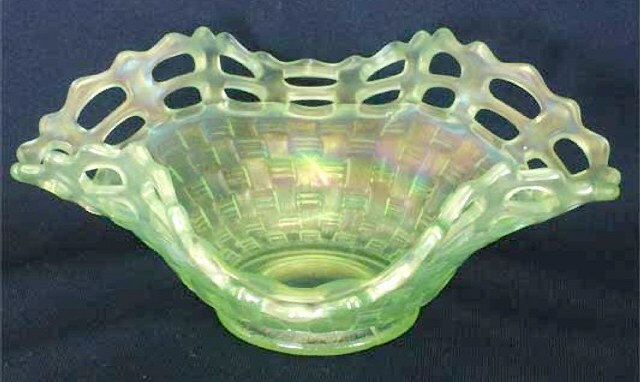 Square bowls are known in celeste, ice green and white. IC shape (round) bowls: celeste, ice blue, ice green, vaseline, and white. Square hat: celeste. 2-sides up bowl: celeste, ice blue, marigold, white. 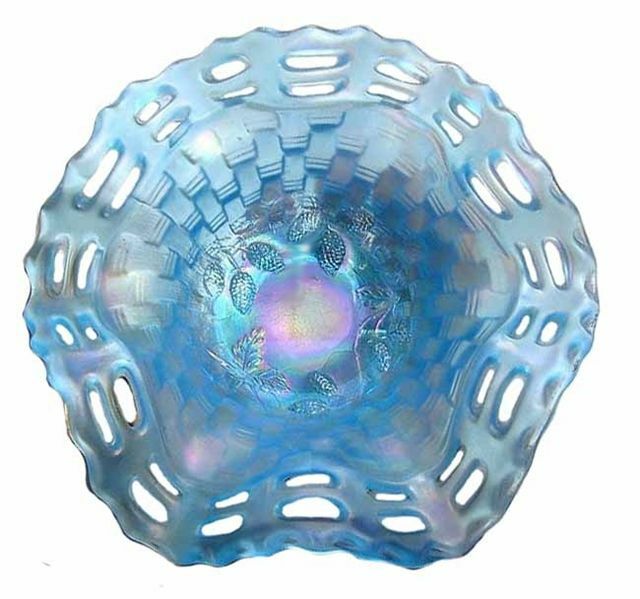 Ruffled bowl: celeste, ice blue, ice green, purple, red, white. BLACKBERRY OPEN EDGE - RARE Celeste. 2-Row OPEN EDGE - 5.75 in. across. 3.25 in. high. 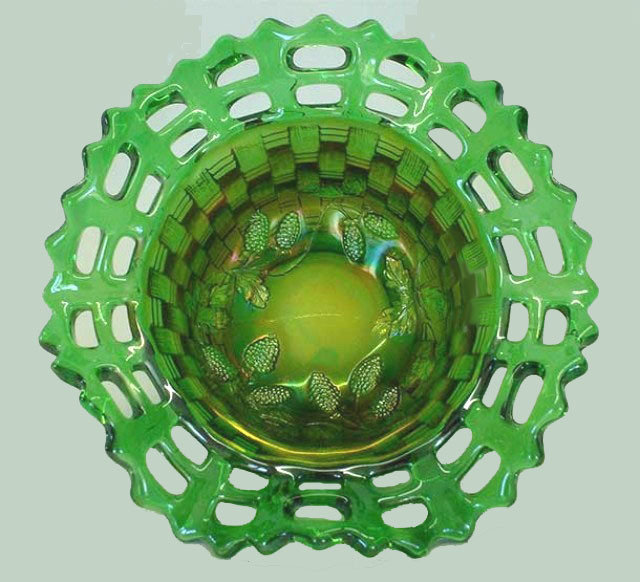 Green Ruffled BLACKBERRY OPEN EDGE Bowl. OPEN EDGE BLACKBERRY Plate in White and Blue. Ice Green OPEN EDGE BASKET. Courtesy Seeck Auctions. Sold for $7,500. OPEN EDGE Vase - Blue. 2-ROW OPEN EDGE BASKET: These have a smaller base and are more available than the 3-Row variety. 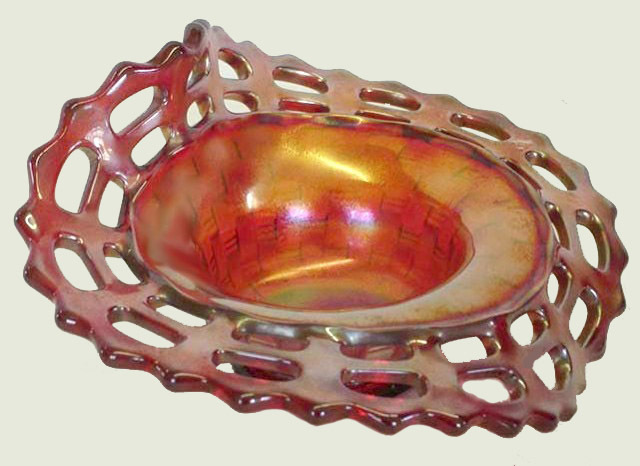 Base size is 1 7/8” and was used for the John H. Brand & Miller Furniture advertising baskets. Some examples in this size offer the Blackberry Interior, both in bowl, spittoon shape, and plate form. Ruffled hat shape, two-sides up, square, or four sides up are found more often than jack-in-the-pulpit examples. (It would be interesting to know the reason Frank M. Fenton chose to retain this white banana boat shape?) Some 18 various Fenton colors are exhibited in this design. Plates in 8” size are known in marigold, Vaseline opal and blue. There is nothing as encouraging as a cheerful word of greeting. It takes 72 muscles to frown, but only 14 to smile! 03. Be generous with praise, cautious with criticism. Recognition and appreciation are priceless gifts! 04. Be considerate of the feelings and opinions of others. 05. Be alert to give your time and efforts away. What counts most in life is what we do for others! who is hurting. Include Scripture! Let your loved ones know, in ways they can feel, that they are important. accept and encourage their unique personalities and traits. Jesus has written the word HOPE in every heart!